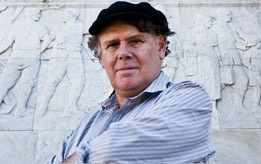 Harry Ricketts has lived in New Zealand since 1981. He teaches English Literature and creative non-fiction at Victoria University of Wellington and co-edits the quarterly review journal New Zealand Books. He has written or edited over twenty-five books, including a biography of Kipling, nine collections of poems, extended personal essays and various anthologies. In 2010, he published three books: the anthology The Awa Book of New Zealand Sports Writing, 99 Ways into New Zealand Poetry (with Paula Green), and Strange Meetings: The Poets of the Great War, a group-biography of a dozen WWI poets. His most recent collection of poems is Just Then, published earlier this year by Victoria University Press. He was the featured poet in the latest issue of Poetry NZ. He is a talented and sensitive classical pianist, currently being taught by well known poet and musician, Denys Trussell. Sane-Va is a well balanced young man. Music plays a vital role in his life, as does knowledge of his Samoan heritage. He is fully involved in sports, both coaching and captaining rowing at his school. In addition, he is forging an outstanding academic record. Year 13 student Sane-Va Ginnen will compete in the prestigious Ronisch Piano Competition at the Raye Freeman Arts Centre from 19-21 October. Only 15 students have been accepted from nominations by high schools across Auckland. Each competitor plays a 20 minute set of classical pieces on Saturday, and six go through to the final on Monday evening. Sane-Va has been learning piano since he was 6, and is now practicing two hours a day in preparation for the competition. He will play pieces by Bach, Mozart, Chopin and Debussy. Prizes are shared between the successful competitors and their Schools Music Departments. Additional awards are made by the Education Section of the Auckland Philharmonia Orchestra. This year’s adjudicator is Sarah Watkins of the New Zealand Trio. “Sane-Va is not only an accomplished player, but also a really good composer in the Baroque style,” says Head of Music, Ms Milica Zjajic-Moon. Sane-Va plans to start an engineering degree at Auckland University next year, but would like to study music as well eventually.